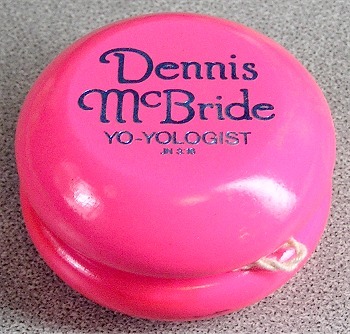 One of the custom models made for National Yo-Yo Master Dennis McBride, by Hummingbird Toys. Dennis McBride's models usually displayed the "Genuine Hummingbird" logo on one side, and his custom logo on the other. This one is a Hot Neon Pink (very tough to photograph) with a Blue foil impressed logo. Very nice combination.